Plasticulture is detrimental to many small, vegetable-producing farms. The term plasticulture means just what it sounds like - a system of growing crops where a significant benefit is obtained by using products derived from polyethylene polymers. Plastics are involved with all stages of vegetable plant production: site preparation, seeding, transplanting, growth, harvesting and marketing. Tomatoes, melons, squashes, cucumbers, onions, strawberries, broccoli, cabbages, and salad greens all use plastic in their production. Actually, probably more crops do depending on the time of year, but you get the idea. Let’s look at tomatoes, an important crop for many farmers, and all the kinds of plastics used during a production season. Here in New Hampshire many tomatoes are grown in high tunnels - think unheated greenhouses with simple quonset-style frames that are covered by a single layer of greenhouse plastic. These structures offer warmer daytime temperatures and protection from weather. They help stretch the cropping season; crops can be planted earlier in the spring and harvested later in the fall. I’m getting ahead of myself. Tomatoes seeds need to be sprouted, and grown to seedling size before they are transplanted into a high tunnel. This stage of production happens in a true greenhouse with heat and everything (lots of plastics!) in March and April. Seeds are often sown in small-celled trays and then transplanted to larger cells, or pots. 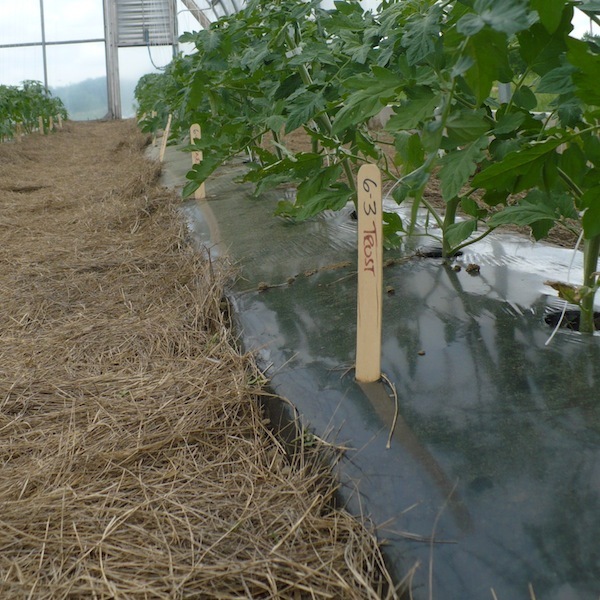 Prior to planting the tomatoes into the tunnel, plastic drip tape is laid down and connected to a fertilizer injector and water source. Drip tape is porous on one side and keeps irrigation water (and fertilizer) directly around plant roots, thus reducing water use by ¼ to ½ in comparison to overhead, sprinkler irrigation. Planting beds are also covered in black plastic mulch. This traps solar energy to promote root growth, and decreases weed pressure around crops. Weeds are one of the biggest problems on small farms. To keep tomato plants from covering the greenhouse floor in a giant, tangled mess they are strung up to the ceiling with plastic twine and trellising clips. When mature, tomatoes are even harvested into plastic bins. Some of these can be used during multiple seasons - for example greenhouse plastic generally lasts five years. But the irrigation, mulch and trellising is good for just one season. Especially when used on an organic farm. Plastic use is allowed in organic farming as long as it is removed at the end of the growing season. Where does it go then? Usually into the dumpster, resulting in billions of tons of waste. This seems totally contradictory to the ideals of organic farming, right? I am not alone in writing or thinking about this. People are thinking about methods of reducing or reusing all the plastic waste that is a result of modern farming. AgBagsis a company that makes bags from used (and clean) drip tape. Reusing the plastic as fuel, called plastofuel, is another option. Biodegradable plastic mulchesmade from plant starches have been developed. So far, they aren’t available for use in the US because they do not comply with national standards for organic production. Of course, there are alternatives to using plastics as well (people have farmed for centuries without it after all). Cover cropping, crop rotation, and using crop residues as mulch are all methods of decreasing weeds and increasing soil fertility. (Remember, weeds are one of the biggest problems on small, organic farms.) These methods can take time, space and money farmers don’t always have, and they don’t offer immediate results. Innovations are also being made in the form of tools. Cowpots are made from cow manure. Soil block makers press soil into cubes that seeds can be directly planted into. So, should you stop buying food from small farms because of all the plastic used? No! Consumer demand drives innovation, and innovation is happening. Recycling plastics used in agriculture is a start, but reducing them is even better. So stay hungry (both for food, and data).